We were already enthused by the concept of sausage and bacon coupled together already, unlike with the egg mcmuffin where the customer must demand this heavenly combination. We were given the option of ketchup or brown sauce, we both opted for ketchup. T’was not love at first bite but as we delved closer to ketchupy, sausagey, bacony centre we found pure bliss and agreed to surrender our pessimism to the dance on our lips.There was the typical, wonderfully artificial cheese slice that adorns much of McDonalds menu. The sweetness of the onions adds another flavour sensation but be warned, they piled ours high with the layered treats so if you’re not a fan we advise you specify to the elf (what else would you call a person who spends all year creating parcels of joy for the citizens of the world?) behind the counter that you’d rather it came without them. We ordered the meal with hot chocolate as a concomitant and of course, an obligatory hash brown. Mcdonalds hot chocolate is surprisingly tasty. Not terribly chocolatey, but milky and sweet enough to get away with it. 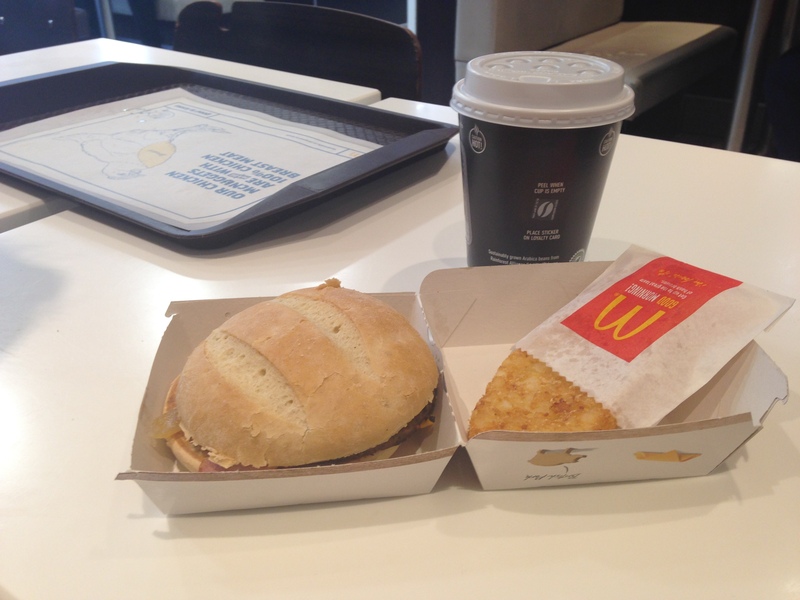 The hash brown was, of course, outstanding as can be expected from Mcdonalds.